Marine & Mechanical Engineers, Structural Fabricators :: A C Roy & Co.
A C Roy & Co. Celebrating 50 years of service to the society and the nation! Established in 1964 A. C. Roy & Co. has cruised upstream slowly but steadily to emerge as one of the leading ship builders and ship repairers in the private sector in India. Innovative designs, coupled with optimum utilization of skill and determination led to the triumphant progress of the organization. Indomitable quest for perfection paved the way for the creation of an ever increasing array of satisfied and loyal customer base. Vessels built by us and inspected by National and international classification societies are sailing on an even keel in Indian and Bangladesh waters. Propelled and non-propelled vessels up to 65 meters in length have been built in the company's two shipyards. Dry Docking repairs and special surveys for vessels up to 2000 DWT have also been meticulously carried out at our well equipped yards. We provide top quality services worldwide A. C. Roy & Co. started its operations in 1964 at Kolkata in India .We do have two well equipped shipyards at Ghusuri & Shibpur, Howrah where we undertake new construction and repairing job of various marine crafts, marine structures and other marine related jobs. 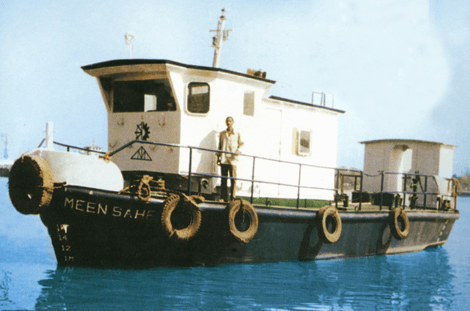 Today, we are capable of making a wide variety of vessels including Passenger Ferries, Pilot Launches, Survey Launches, Bollard Pull Tugs, Accommodation Boats, Trawlers and Multipurpose Tugs, etc. Our capabilities could be extended to other types of vessels as well through the creation of a new centre of excellence. 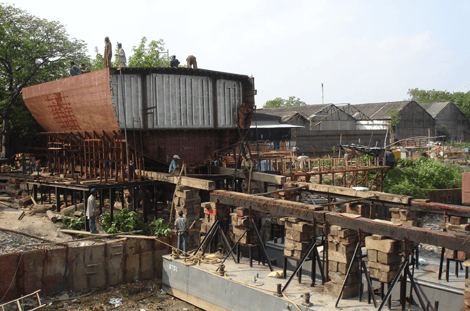 We have initiated modular construction at our yards with tie-ups with GRSE Limited (a defence shipyard under Govt. of India, MoD) to undertake Hull Block building services for several naval crafts. A. C. Roy & Co. has its corporate headquarters and registered office at Kolkata, India. We have had a successful operation since the last 50 years, with various Govt./Semi Govt./Private organizations. Our expertise in Ship Building and Ship Repairing has grown over the years. Our strength lies in our ability to make ships effectively & within the scheduled time resulting in high levels of customer satisfaction. We, A. C. Roy & Co., are now a CRISIL verified company that checks an SME's credibility and trustworthiness. Verification is done by, CRISIL, a govt. approved credit rating organization & issues post verification of company's credentials pertaining to proof of existence, legal status, statutory approvals, affiliations and quality certifications. We undertake ship building at both our Yards in Shibpur & Ghusuri. Both our shipyards are equipped with modular skids to undertake pre-fabricated block building. Convenient material handling facilities are also available. We also have facilities of highest quality manual & semi-automatic MMAW, MIG & TIG Welding. We have developed in-house state-of-the-art electrical shop, machine shop, carpentry shop and paint shop to reduce the lead time in the completion of our projects. We also have a bonded warehouse to facilitate hassle-free import of machineries, equipment & other raw materials. 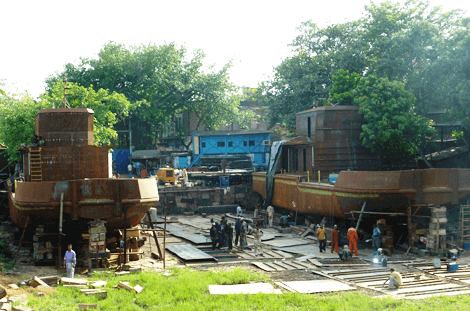 The Shibpur yard is equipped with a dry dock to undertake new constructions, with an approx. area of around 225 sq. mtr., which is converted into a functional wet basin for undertaking round the clock outfitting work, after launching. The Ghusuri yard has highland ship-building berth from where ships can be launched by a slipway. Trained & experienced mechanical fitters undertake fabrication & erection work to ensure quality ships being built under the inspection of National & International classification societies, Directorate of State IWTs within scheduled time. We undertake ship repairing at both our yards - Shibpur & Ghusuri, with the former having a river frontage of 85m & the later 55m. Special survey to hull, machinery, Dry Docking survey, On-board repairs are regularly undertaken at both the yards for several inland marine crafts & inland barges up to 3200 DWTs. 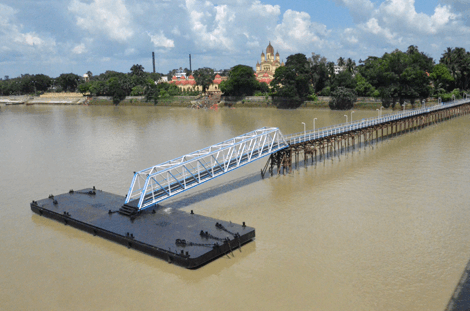 As a part of our diversification programme, we have ventured into design, fabrication & erection of complete riverine infrastructure projects like Floating Passenger Jetty Terminals, Cargo Terminals, Modular Terminals including construction of mild steel/aluminium Gangway & RCC walkways with complete Mooring systems. We own multiple single-screw & twin-screw tugs, registered with the Directorate of West Bengal, built by us. We provide them on charter with necessary manning services. For detailed technical specifications & interest in charter, please contact us. We undertake Hull Block Building at both our yards - Shibpur & Ghusuri. Both our shipyards are equipped with modular skids to undertake pre-fabricated block building. Convenient material handling facilities are also available. Pre-out fitting works including piping & machinery seatings are also undertaken simultaneously. 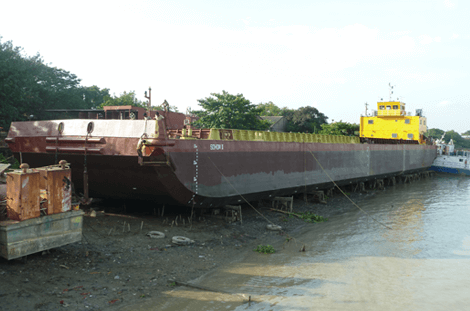 We undertake complete manning services for all kinds of inland vessels in NW-1 & NW-2. Several crafts owned by IWAI & manned by us are in successful operation in both NW-1 & NW-2. A. C. ROY & CO.
Powered by SevenM © 2019 A C Roy & Co. All rights reserved.